This is the story of seven veterans of the British Expeditionary Force who sailed across the English Channel to France after Britain declared war on Germany in 1939. Larry Urens, Sid Lewis, Reg Beeston, Sydney Whiteside, Jack Haskett, Les Clarke and Stanley Chappell were all young lads in their late teens or early twenties. None of them had ever seen war before. Like most of their fellow soldiers, they had joined up for adventure or the prospect of a secure wage. They were fit, trained and proud to wear the armband of the British Expeditionary Forces. For many the first months were strangely peaceful. Their money went far in France and they enjoyed the local hospitality, the bars and dance halls of the local towns. Only one man, Sid Lewis took part in some brutal fighting, on the Franco/German border in Alsace. For the rest it was almost like a holiday. This ended abruptly when the Germans invaded in May 1940. They advanced with shocking speed. The German armoured columns sliced through neutral Holland and Belgium. Tanks led by General Rommel drove deep into French territory south of the British forces. The French Army collapsed and within a week, the soldiers of the BEF were forced to retreat. Fighting tough and bloody rearguard actions, they endured relentless shelling and fearsome dive-bomb attacks. Constantly on the move, facing a German onslaught on three fronts they became exhausted, hungry and low on ammunition. To avoid a complete catastrophe Operation Dynamo was started, and the Royal Navy organised to pull the men from the beaches of Dunkirk. So the seven veterans, now in various parts of the shrinking British perimeter headed finally to their one chance of salvation. 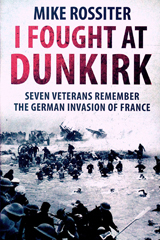 The seven men in this book went through a hellish baptism of fire in the first battles on the front line, and fought in the last ditch defence of Dunkirk. They saw their comrades bombed and drowned off the beaches. They faced German tanks while they were armed only with rifles. Les Clarke’s unit of the Durham Light Infantry lost half its men. Stanley Chappells Royal Horse Artillery battery at Mont Des Chats saved their last three shells to destroy their own guns as they were overrun. Sid Lewis was one of the few who escaped a mass execution by an SS Regiment at Wormhout. The individual accounts of these seven veterans take the reader through every aspect of their war, from confident idyllic days of the phoney war in the French countryside, to the sudden shock of battle, leading to the fear and confusion of retreat and the wait for an uncertain rescue. They are eye opening, compelling, and reveal the shocking reality of the days of fighting that lead up to the evacuation at Dunkirk.